To say its been a busy week has been an understatement. Lets just say that I completed my 40 hour work week by 10am on Wednesday. However its Friday and I am still working. I also have an initial consult with a woman who has an Autism Spectrum Consulting practice. I never knew there was such a thing or what she does, but I will find out on Monday and report back to you lovely people next week. I am thinking that since my son’s diagnosis is less than a year old, We’ve been flying without an IEP and are moving to Maryland this summer, it would be good to speak with a professional. Anyway, enough of that, lets break out the juicy Ryan goodness. 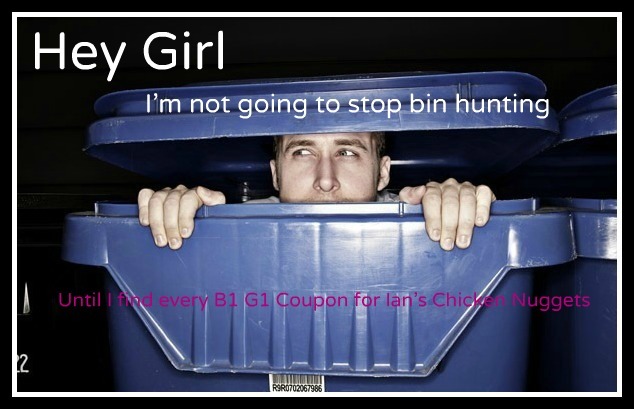 B1G1- Is Buy One Get One Free- just for those who may not have had enough coffee prior to blog hopping. We call it BOGO. . . and I was completely ignorant of what it meant until a week and half ago. funny story. . . (imho). what is it with spectrum kids and nuggets? I shouldn’t question it. . . just be thankful their ARE nuggets. Maybe nuggets are a special needs delicacy? My daughter (3.5) with CP loves them too. Meh, as long as she eats. As for the IEP – that must be tough. Hope it all works out soon. And I love your Ryan!!! Autism, couponing, and chicken nuggets all in one post – outstanding! Yeah, there’s definitely something about chicken nuggets!